Mountain Dew and waffles. Two foods you never thought would go together, and yet, they do. Or rather, they “dew.” (Sorry, we had to.) 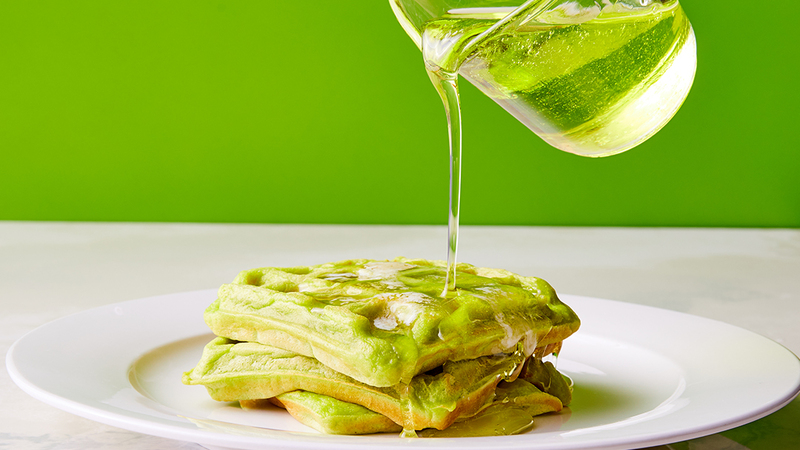 This Mountain Dew waffles recipe is made with your favorite lemon-lime soda, and it tastes straight-up like Mountain Dew inside of a toasty waffle—which is surprisingly delicious. But the real cherry on top of this recipe is the Mountain Dew-flavored syrup. Let it flow down like electric green lava on your delicious mountain of waffles. Pro tip: Try this recipe at home in other soda flavors. The 10-year-old version of yourself would definitely appreciate this breakfast food, but your adult self will love it too. Active 30 min. Total 30 min. 1. Prepare the syrup: Stir together sugar, Mountain Dew, corn syrup, and, if desired, food coloring in a medium saucepan over medium. Bring to a boil; reduce heat to medium-low, and simmer until thickened and syrupy, 10 to 15 minutes. Let cool 10 minutes. Syrup can be served warm or room temperature. Store in an airtight container at room temperature up to 3 days. 2. Prepare the waffles: Preheat a waffle iron to medium-high. Stir together flour, baking powder, salt, and baking soda in a large bowl. Stir together sour cream, Mountain Dew, and eggs in a separate large bowl until thoroughly combined. Pour sour cream mixture into flour mixture; whisk until smooth. Add melted butter and, if desired, food coloring; whisk until thoroughly combined. 3. Coat waffle iron with cooking spray. Pour about 1/3 cup batter into each quadrant (will depend on size of iron), close lid, and cook until lightly browned and firm, 2 to 3 minutes. Top with butter; serve with syrup.